I've gone with "Cute" today. Not something I do often but I enjoyed making this card. I've used the fun stamp set called Everyday Hero for today's card. The cardstock is Smoky Slate, Basic Gray, Whisper White and some SAB Glimmer paper from the stack in Mint Macaron. I love the Comic Book look of these Super heros in this stamp set and don't think they are just for children. They can be enjoyed by both young and old. I coloured the image with a combination of inks and Watercolour pencils and I masked and sponged around the city skyline and cut it out with the Stitched Shapes framelits. Here's a closer look. Its Tuesday and time for another challenge at Stamp, Ink, Paper. This week its all about the colours below and we hope that you will join us. I've used cardstock of Smoky Slate Elegant Eggplant, Whisper White and Silver Foil. Here are some closeups. The greeting was cut out with the Stitched Shapes framelits. While I had all these inks and stamps out I made a second card with similar colours. Closeup of the floral stamp from Awesomely Artistic set. Here are both cards, similar backgrounds and materials, but different. Thanks so much for stopping by today. 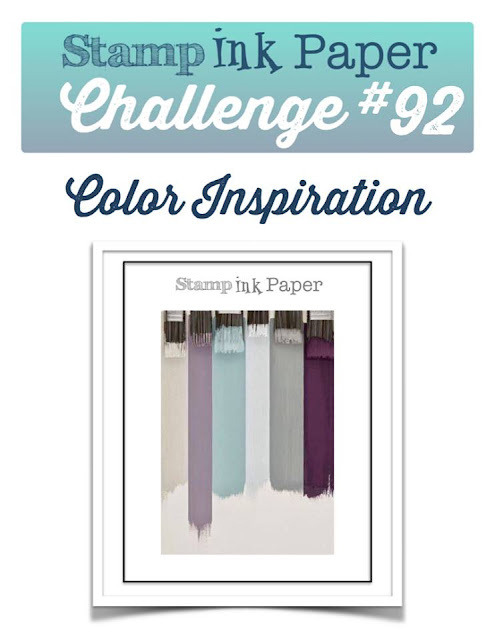 We look forward to your take on our Inspiration challenge this week at Stamp, Ink, Paper. Its Wednesday once again and time for another challenge at the Paper Craft Crew. I've opened up a new set of dies that I recently purchased called Flourish Thinlits. I've teamed them with cardstock of Basic Black, Pool Party, Whisper White card and the SAB Glimmer paper. The Patterned paper on the background of my card comes from the Cupcakes and Carousels paper stack. The Silver ribbon also comes from SAB. Here's a closer look. The Glimmer is the Bermuda Bay colour from the 6 x 6 SAB pack that you can earn for free with a $90 purchase while stocks last. I'm pretty happy with how this card turned out. Thank you for joining us this week at the Paper Craft Crew. Can't wait to see your creation. Happy Tuesday and Happy Birthday Andrea. Its time for this week's challenge at Stamp, Ink, Paper. Please join us. 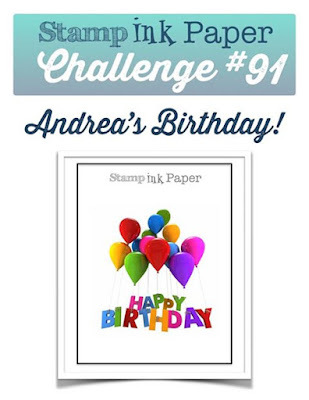 As it's Andrea's Birthday that seemed the perfect theme for this week's challenge. Birthdays are all about at the moment. We just celebrated my eldest daughter's 18th Birthday as well, and while this is not the card I made for her, there is a pic below of her Birthday cake which goes with our theme this week. My card was made with the Up and Away Bundle which includes the Lift Me Up stamps and the Sale-a-bration designer paper. Cardstock used is Pacific Point, Mint Macaron, Whisper White, Calypso Coral and Dapper Denim. I didn't actually make this card with Andrea in mind either, but I am always in need of Birthday cards and this is one I taught to my ladies in my last card class. I wanted to share a card made for a friend of my daughters. I was told she likes Red & Black. I used some retired Raspberry Ripple card I found to go with the Black and I've used the SAB Black and White paper called Inside the Lines. The greeting comes from the Sale-a-bration stamp set called Avant Garden. I love how this turned out and the Birthday girl loved it too. Enjoy the rest of your weekend. 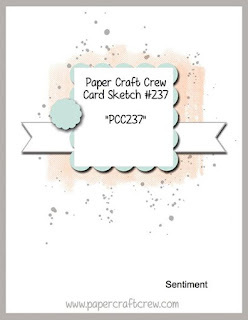 Welcome to this week's sketch challenge at the Paper Craft Crew. I've used my May Flowers framelits combined with Stiched Shapes framelits and Sparkle embossing folder for this card. The cardstock is Crumb Cake, Watermelon Wonder, Whisper White and Mint Macaron. The strip of dsp is from the Affectionately Yours pack. Here's a closer look at the diecuts and background embossing. Thanks so much for stopping by today. 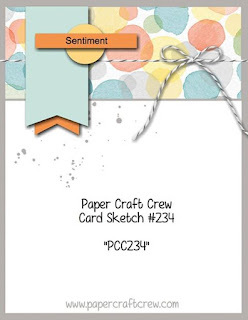 Looking foward to you joining us with your take on this week's sketch at the Paper Craft Crew. Have a great day. Welcome to this week's challenge at Stamp, Ink, Paper. 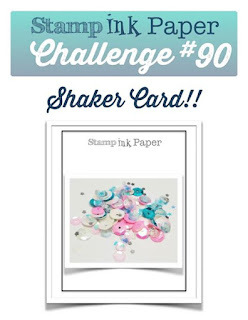 Your challenge, if you choose to accept it, is to create a Shaker card. Expect to see some amazing creations from our talented team this week. I've used Dragonfly & Oval framelits for my card today. The Birthday greeting comes from the stamp set called Birthday Blast and the filling for my shaker are the Sprinkles embellishments from the Occasions catalogue. The cardstock used is Basic Black, Pool Party and Flirty Flamingo and Dazzling Diamonds glimmer for the Dragonfly. I also used some retired Primrose Petals ribbon. Shaker cards are something I don't make very often but I do hope you've enjoyed seeing mine. 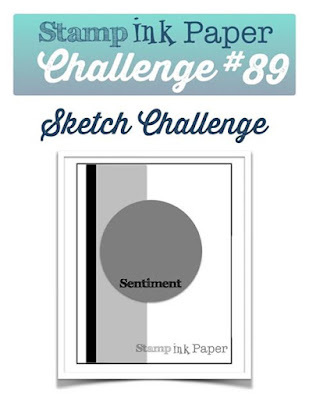 Can't wait to see what you create for the Stamp, Ink, Paper challenge this week. Welcome to our Wednesday challenge at the Paper Craft Crew. This week we have a sketch for you. I've used the Dragonfly framelits for my card with some of the new Sale-a-bration glimmer paper and the SAB Inside the Lines dsp and some Silver ribbon which also happens to be from SAB. The cardstock is Basic Black, Mint Macaron and Whisper White. This is a closer look at the greeting which was stamped from the Up and Away stamp set. This is a closeup of the Dragonfly on my card. The splatters on the Mint Macaron background come from the Gorgeous Grunge stamp set. I quite like how this card turned out.... eventually. Thanks for joining us this week at the Paper Craft Crew and have a great day. I've used the Up & Away bundle for my card combined with the SAB Carried Away dsp and Fancy Frost Specialty Dsp. Come and see. The cardstock I've used is Basic Gray, Smoky Slate, Dapper Denim and Mint Macaron. Here's a closer look at my Balloon below. I added some Basic Gemstones to the project which were coloured with Copic markers. This pic shows up the pattern on the Fancy Frost dsp background a little better. Thanks for joining us this week at Stamp, Ink, Paper. We hope you will join us and can't wait to see what you create with this week's sketch. Have a great day.